Crime-prevention and monitoring systems are designed and installed to customize its system responding to each objective required mainly in stores and facilities. Security System Business provides high functional items and stable system to respond at a high level to purposes and requests of users. Regarding the monitoring camera system, we realize the optimal coordination by various kinds of items and cases of introduction to make it possible to respond to a situation, usage and purpose of setting. We realize to ensure peace and safety for customers by giving a comprehensive solution. 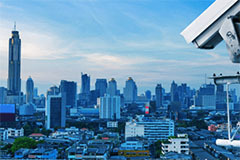 In the monitoring camera market which continues to expand along with growth of safety and crime-prevention conscious, as an exclusive agent in Japan for the security items of LG Electronics and HD-SDI items of CTR in Korea, G-net deals with a wide range of supplies including recorders and peripherals. In addition, regarding the crime-prevention system, G-net develops its original item　”TRUSTY”. In case that TRUSTY recognizes that goods without checking are taken away from the store by mistake through the gate, a tag on goods sounds an alarm that can specify only the goods taken away. TRUSTY has the patent regarding that system. TRUSTY is introduced in high-class boutiques because it can avoid giving uncomfortable feelings to important customers.